Late in The Predator, the whole movie is summed up in the death of a single character. The death happens so quickly and with such little fanfare that you can literally blink and miss it. It’s not until several scenes later when this fairly significant character hasn’t come back that you actually realise what happened. That WTF moment basically describes The Predator, the new film from co-writer and director Shane Black, which restarts the franchise made famous by the 1987 John McTiernan film starring Arnold Schwarzenegger. But while the original film was a laser-focused, sci-fi action extravaganza, The Predator is an absolute mess. It’s as if a bunch of random and sometimes unrelated storylines, subplots, character arcs, mysteries, running jokes, and more were all thrown into a blender and frappéd into a frenzy. Some of what comes out is good, some is bad, but all of it is muddled and will leave you scratching your head, just like when a recognisable character dies in the blink of an eye. Describing the plot of The Predator is challenging, because there’s so much of it, but here are the basics. A soldier named McKenna (Boyd Holbrook) witnesses a Predator spaceship crash landing and sends evidence of it to his autistic son Rory, played by Jacob Tremblay. After the military covers it up and discredits him, McKenna is then sent away with other “loony” soldiers only to find out the Predator is going after his son. The soldiers then decide to go and stop it. Put that way, the plot sounds potentially badass, and at many points it is, but that’s just part of the overly complicated yarn that Black and co-writer Fred Dekker have weaved. 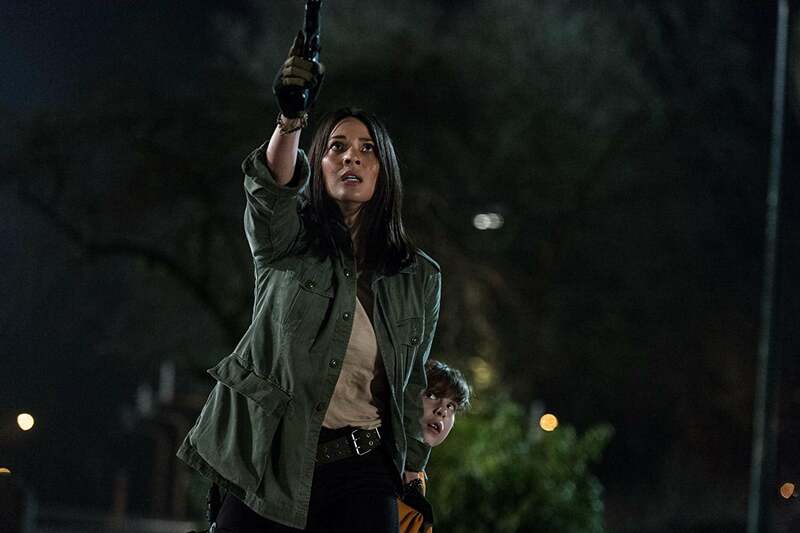 A big part of The Predator also revolves around a mysterious government agent named Trager (Sterling K. Brown) who knows a little too much about the Predators, and scientist Casey Bracket (Olivia Munn), who’s called in for her alien expertise. Those two drive a plot line that attempts to explain why the Predators are on Earth again, what makes them tick, what’s been happening since the events of the original film, and so, so much more. As the trailers reveal, there’s more than one Predator, and some are radically different than what we’re used to seeing. Plus, there are tons more human characters: Jake Busey (whose father starred in Predator 2) has a small role, and Yvonne Strahovski (The Handmaid’s Tale) does as well. Each of the soldiers—played by the likes of Keegan-Michael Key, Trevante Rhodes, Alfie Allen, and Thomas Jane—get some story to play with, and all of these threads run in tandem, creating a film that sort of makes sense, but is bloated and baffling just the same. Obviously though, just because a film has a lot of story doesn’t instantly make it bad. Black himself made films like Kiss Kiss Bang Bang and The Nice Guys, which are similarly complex, dense, and phenomenal. However, in The Predator, it’s different. All of these things are strung together and edited almost without tact. There’s the aforementioned death scene, for example, but also a general feeling that key connective scenes were cut to give the film a more propulsive pace, with little regard for viewers’ understanding of the plot. Multiple scenes feature characters making wild jumps to conclusions. The plot pivots wildly, characters occasionally do things without a hint of believable motivation, and when one person says ”You just pulled that outta your arse,” it rings just a little bit too true. The good thing about having such a robust movie, though, is there are things to enjoy about it too. 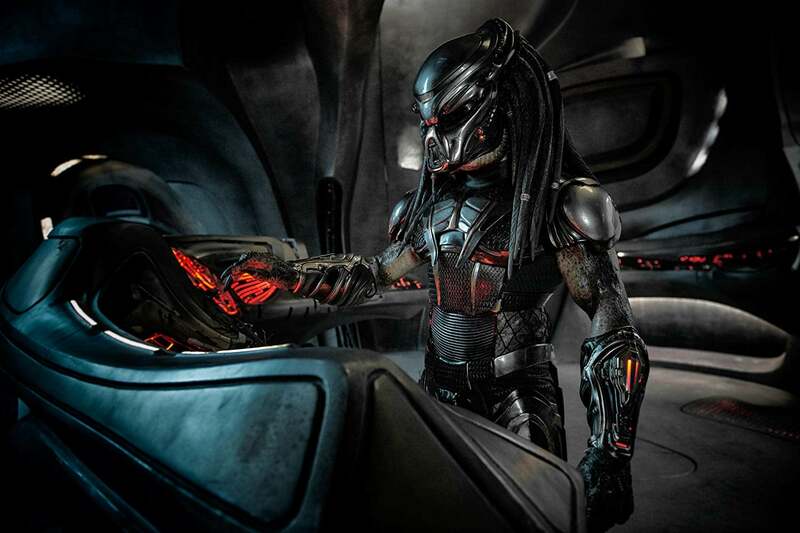 Visually, The Predator splits the difference between the first two franchise films, set partially in the jungle and partially in a more urban setting, simultaneously paying tribute to both. The score by Henry Jackman liberally uses themes from the first film (which was scored by Alan Silvestri), giving it an exciting, pulse-pounding feel. There are some great winks and nods throughout, including a very solid, very random Disney parks reference. The sound design is ear-shattering, and the ideas Black and Dekker have linking the first film to the present are incredibly interesting and rich, even if they don’t get explored to satisfaction. Plus, this is a Shane Black film, so of course the dialogue is going to be razor-sharp and filled with humour. Much of it works, especially in the mouth of the right actors, but other times it falls flat, either due to the delivery or just the archaic, occasionally uncomfortable, subject matter. In particular, Brown and Key stand out with their big, boisterous characters, who spit biting, memorable one-liners and insults every time they are on screen. 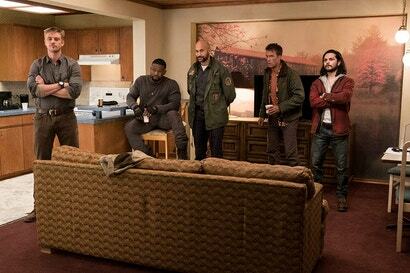 In fact, I kind of wish The Predator would have followed Brown’s character instead of Holbrook’s because he steals the movie in each and every scene. Still, even with all of those things going for the film, it’s simply tough to get over its chaotic nature, especially when it also extends to the action. There are scenes in The Predator that dazzle, with action beats and ideas you probably haven’t seen before, but many times those moments are juxtaposed with difficult-to-follow geography or unrelated tangents. The result is the sense that what you’re watching was almost great, but really isn’t. 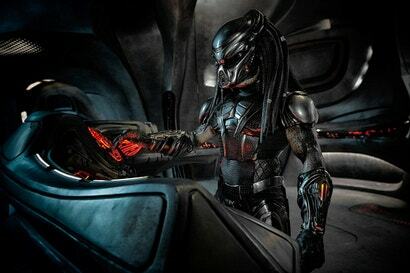 Unfortunately, that’s The Predator. A movie crafted with the best intentions and some really good ideas that probably should have been dialed back. From moment to moment, Black and his team take you from excited to frustrated, confused to elated, and back again. Ultimately, that constant frenzy leaves you questioning not just what the hell is happening but whether you liked the film or not, and that is never a good thing. The Predator opens September 13.